shop-floor control The major functions of shop-floor control are 1. Assigning priority to each shop order. status of orders and work cell/en. A system for utilizing data from the shop floor as well as data processing files to maintain and communicate status information on shop orders and work centers. 3. Conveying shop-order status information to the office. 4. Providing actual output data for capacity control purposes. 5. Providing quantity by location by shop order for WIP inventory and accounting purpoes. 6. Providing measures of efficiency, utilization, and productivity of labor and machines. Exhibit 12.4 illustrates more of the details related to shop-floor control. a normal interaction of supervisor and software. will take. Exhibit 12.5A presents an example of a dispatch list. • Exception reports provide the supervisor with the information needed to handle special cases and problems. 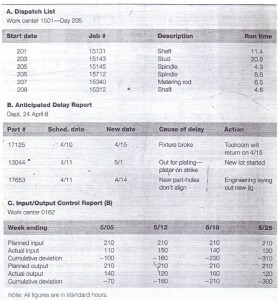 An example of this is the anticipated delay report shown in Exhibit 12.5B. Typically made out once or twice a week. these reports are reviewed to determine if any of the delays are serious enough to warrant revision of the master production schedule. 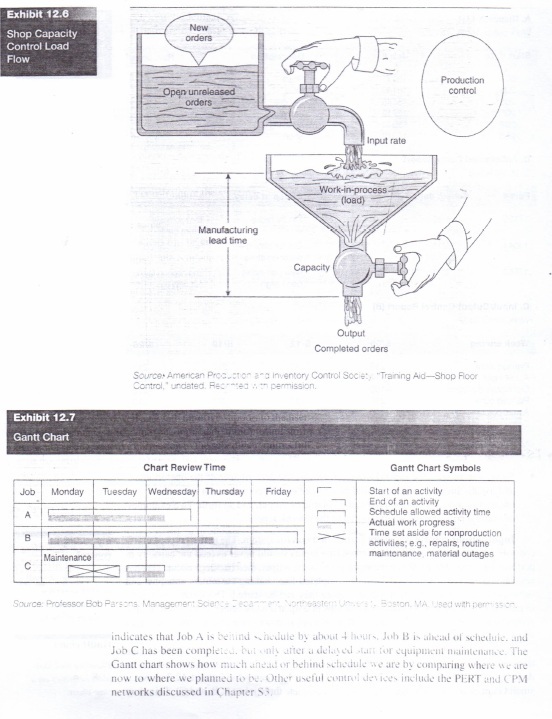 • The input/output control report. or simply the 110 report. iu ed by the -or to monitor the relationship between the workload and the station. 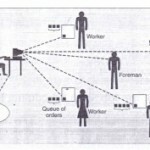 If these relationships are significantly out of balance, then the -supervisor can identify where adjustments are needed. An example of such a report is shown ill Exhibit 12.SC. • Status reports give the supervisor summaries on the performance of the operation, and usually include the number and percentage of jobs completed on time, the lateness of jobs not yet completed, the volume of output. and so forth. 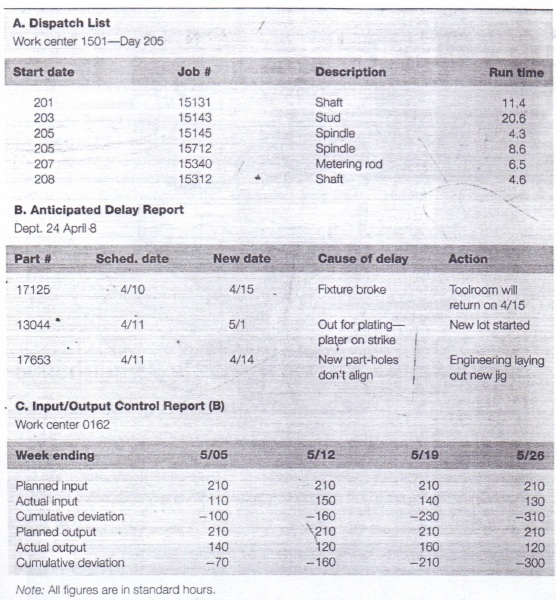 Two examples of status reports are the scrap report and the rework report.Input/output control is a major feature of a control system.control is that the total workload accepted (the input) should never exceed the capacity to perform job (the output). When the input exceeds the output. then backlogs occur. This has several negative consequences: Jobs are completed late. making customers unhappy, and sub: frequent or related jobs incur a delay before they can be started. This delay also result un: satisfied customers. Moreover, when jobs pileup at a work center. congestion occurs, r sing becomes inefficient, and the flow of work to downstream work centers becomes radical. All analogy of this phenomenon to the flow of water is 1 in Exhibit 12.6. A -ripple but effective (antral device is the Gantt chart. It i~ used to help plan and jobs, again, using software, A Gantt chart is a type of bar chart that plots ta ks to bee against time. It also helps show relationships between jobs. Exhibit shows a Igantt chart for a job shop attempting to complete three jobs (A, B. and C). This chart. Shop-floor control systems in most modern plants are now computerized, with job status information entered directly into a computer as the job enters and leaves a work center. Some plants have gone heavily into bar coding and optical scanners to speed up the reporting process and to cut down on data-entry errors." As you might guess. the key problems in shop-floor control are data inaccuracy and lack of timeliness. When these occur, the information fed back to the overall planning system is wrong and incorrect production decisions are made. 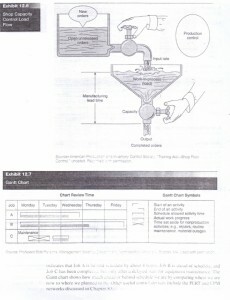 Typical results are excess inventory and/or stockpot problems, missed due dates, and inaccuracies in job costing.Of course, maintaining data integrity requires that a sound data-gathering system be in place; but more important, it requires adherence to the system by everybody interacting with it. Most firms recognize this, but maintaining what is variously referred to as shop discipline, data integrity, or data responsibility is not always easy. And despite periodic drives to publicize the importance of careful shop-floor reporting by creating data-integrity task forces, inaccuracies still can creep into the system in many ways: A line worker drops a part under the workbench and pulls a replacement from stock without recording either .transaction. An inventory clerk makes an error in a cycle count. A manufacturing engineer fails to note a change in the routing of a part. A department supervisor decides to work jobs in a different order than specified in the dispatch list.